The first Local Food Box pick-up of 2017 was 20 weeks ago. After over 6.5 tonnes of vegetables & fruits, 360 meat boxes, 140 flower bouquets, and 6720 eggs….it’s a wrap! Thank you to our members for joining our program and supporting local farmers. We hope you enjoyed this season of food & flowers, and that you will sign up again in 2018. We will let you know when registration opens, and we always prioritize returning members. A special thanks to the farmers who make it all happen, as well as the Cook St Village Activity Centre and the Vic West Community Association for letting us distribute our products outside their facilities. Last but not least, thank you to Coco and Erin, who joined the Wind Whipped Farm crew in 2017. Read on for a few highlights of the season at Wind Whipped Farm, and stay tuned for the 2018 registration. As always please get in touch if you have any feedback, we love to hear from you. This year we successfully increased to 100 weekly vegetable and fruit shares from 75 in 2016. Overall we got great feedback on the diversity, quality and value of the products, but like every year we also had some ups and down. We produced very little pears and apples (no plums) but the root crops were bountiful and we were happy with our tomatoes and salad production. 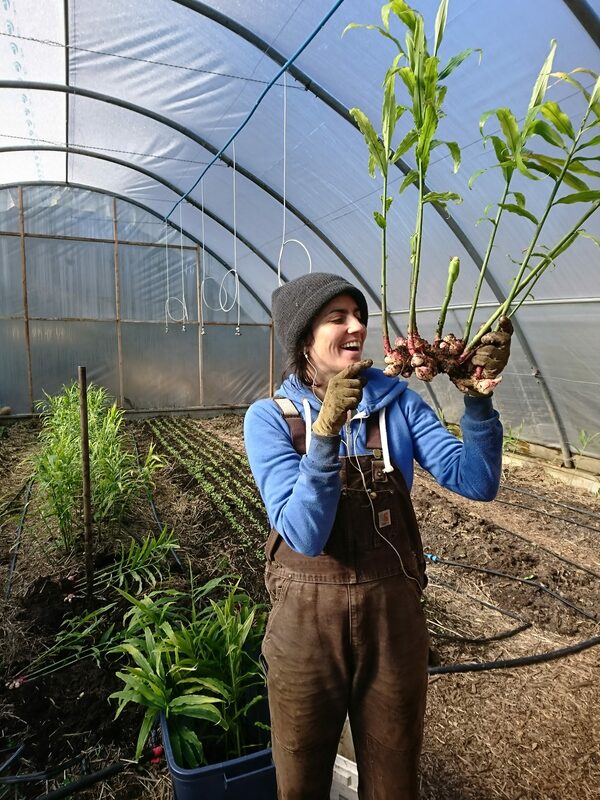 Coco, Erin and Alex harvested over 1,400 lbs of carrots over the course of the season. 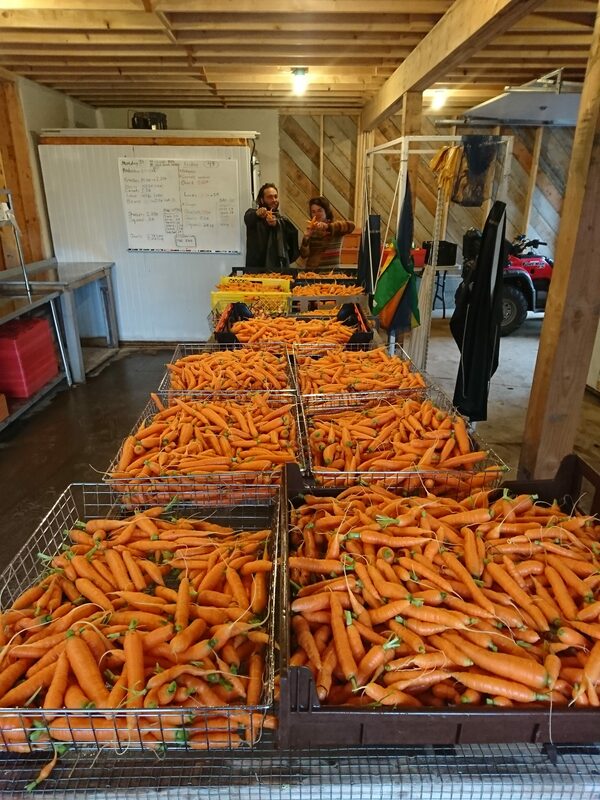 The photo below is Coco and Erin in our workshop with our largest harvest of carrots for the last week of the box program. Baby ginger was new for us this year. It is harvested earlier than the grocery store ginger. The taste is stronger, fresher and the texture is less fibrous. We got great feedback on this new crop, so baby ginger is a keeper! Below, Virginie is pretty excited about one of our biggest ginger root. Both Summer and Winter Squash were a challenge this year. With cold weather and strong winds in the spring, the stem of about a quarter of our plants were snapped off just as they were starting to develop fruits. Bummer. 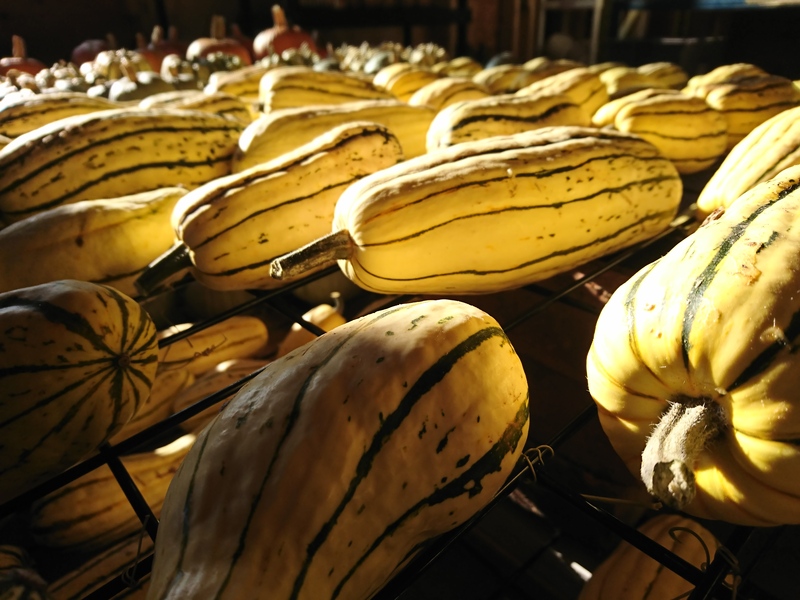 We have the winter to come up with some sort of wind break solution…Until then we will savour the delicata squash(below) that made it! 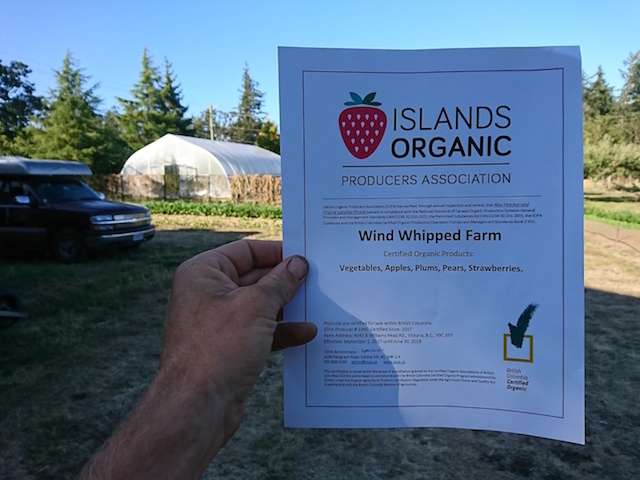 Wind Whipped Farm produce has always been grown organically, and this year we became certified with the Islands Organic Producer Association. Organic practices help us build healthy soils that grow food that is good for people and the planet. We are certified organic because we want to be counted as a farm that cares about promoting organic practices and supporting the organic sector. We also benefit from being part of the organic farming community and movement, and we hope to see both the community and the movement continue to grow. 9 Responses to 2017: It’s a wrap! Thanks SO much for your dedication and passion for growing healthy and incredibly delicious produce! We are so stoked to support you! This year was the best ever and we look forward to many many years to come! Congratulations to all of you at Wind Whipped Farm. We truly enjoyed our food, meat and eggs picked every week. I think we have a little bit of a withdrawal today Saturday with no pickup yesterday! Thank you again, we are looking forward to next year for our Friday ritual! Congrats on getting the organic certification! Thanks for an awesome season of veggies. Will look forward to next year! You are awesome. Thanks so much for being dedicated farmers! Thank you so much for providing our family with delicious vegetables. Every friday was like christmas with my girls waiting to see what veggies we had received. Enjoy your winter and we look forward to our boxes next year!!! once again thank you for all your time and efforts with such an important enterprise. The weekly vegetable boxes you provide are wonderful. Thank you for the great fresh veggies – salad bags, carrots, garlic, shallots, onions, parsnips, radishes, various squash, fresh ginger, etc. A real bounty. This year I did miss the small kohlrabi that you had last year. They are so tender and delicious when they are about the size of a tennis ball. The bi-weekly flowers from Ninebark were a delight. They brought so much cheer into my home. In addition to great food, everything is so well organized. Thank you for a great year! Also, congratulations on getting your official organic certification. Good job and a real credit for all your planning and hard work! Have a renewing winter. We love having you at the Cook Street Village Activity Centre. We look forward to working with you again next season! The food you produce is one of the best things about living in Victoria. I feel so lucky to eat it. And yeah, the tomatoes were SUPREME this year!! And the ginger is indeed really good. I made a lemon ginger chicken soup with your parsnips that is amazing. My only problem now is re-adapting to grocery store veggies. I’ll miss seeing you on Tuesdays and hope you have a great winter and see you next year! !